Stylish short taper haircut for men: Ashton Kutcher showed off his tapered haircut while walking the red carpet at the “Killers’ premiere. This is one of the most popular short cut for men this season. A taper hair cut refers to the back and sides of the hair being graduated in length shorter from the upper back and sides to the edge of the hair growth around the ears and at the nape of the neck. In a barber shop, taper also usually implies that the edge at the nape of the neck will be further tapered down to the skin = #000 length blade on the clipper. This is also called a zero tapered edge at the nape of the neck. Typically the sides are not tapered down to zero around the ears unless it is a crew cut, flat top or butch haircut with traditional short sides. 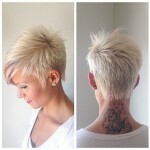 Another consideration is the extent that longer hair from the top will hang down on the back and sides. 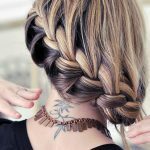 If it does, the longer hair from the top can be blended into the short tapered hair or there can be a definite demarcation line between long hair from the top and short tapered hair on the back and sides.